Ghostvillage launched Spring of Culture 2011 to celebrate the emerging scene of paranormal inspired creative arts. "The shows" — paranormal reality TV — often dominate the discussion. That is only a small part of the story! Off of the TV screen is a growing community of artists, writers, and musicians who engage paranormal themes (ghosts, paranormal investigation, and other supernatural elements) in web cartoons, comics, tarot card art, and in other distinctive outlets. Plus, some cast members from "the shows" are doing creative stuff in their free time. Consider Spring of Culture 2011 as an online Festival of the Haunted Arts — and only at Ghostvillage! Spring of Culture 2011 has profiled some amazing artists and writers: Tara Normal's creator, H.C. Noel; Terri Garofalo from Entities-R-Us; artist and Tarot creator, Jackie Williams; author Marley Harbuck Gibson; the magical Paulina Cassidy. Most were artsy prior to reality TV, but the shows have certainly introduced new audiences to their work. But what about the people we see on the shows? Do any of these personalities harbor great reserves of creativity? Paranormal reality TV allows viewers to enjoy their favorite cast member(s) haunt jaunt in the dark. Yet, the "ghost hunter" persona is only part who these individuals are off-camera. Paranormal State's Michelle Belanger, for example, is a gifted vocalist. Patrick Burns from Haunting Evidence plays guitar and composes music. Viewers often fail to realize that most cast members are complex and far more than just reality TV stars. One of the most creative ghost hunters is TAPS's Grant Wilson. I've spent some time speaking with him about his artistic pursuits; Grant's creative energy is vibrant and impressive. It is an honor for Ghostvillage to allow readers a little peek of his inner world. For the first time in an interview, Grant shares detailed information about his extraordinary novel (which includes original art work), the creative process, and an exciting music project that is very much a family affair. Ghostvillage welcomes our final Spring of Culture 2011 resident artist/writer/musician — Grant Wilson! You are defined by SyFy's Ghost Hunters, which is not a bad way to be known! 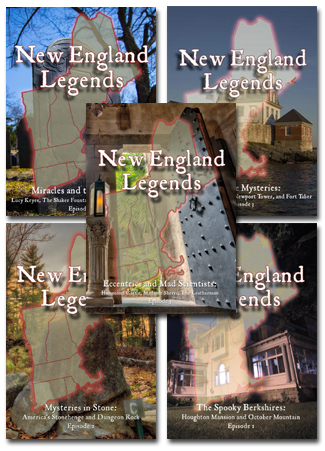 Yet, there is so much more to Grant Wilson than just paranormal investigation. Tell us what characterizes you off-camera in terms of creativity? Well, I do love the paranormal but it only defines about 10% of my life's interest. My source of happiness can be traced to one simple thing: creativity. As long as I am creating something, I am happy. Music, languages, cooking, art and nature truly fascinate me. I taught myself how to play the guitar and piano when I was fourteen. I took one lesson of each at the behest of my parents, but I found that the lessons only restricted me. Now I have solo piano music I share, as well as the music of my band, Carpetshark, that myself, my wife and my two great friends, Chris Caron and Chris Montecalvo, are preparing to share. Cooking is also a passion for me. I love knowing how the ingredients work together and change depending on what is in the dish or when it is put in. I love to make the best version of a popular dish more than get too exotic. I love minimalist camping, kayaking, and hiking. Being outdoors away from civilization and technology recharges and comforts me. I love going out into nature with nothing but a bag full of a few essentials and your wits to get you through your trip. One time, while filming Ghost Hunters, we were in a hotel in a large city. The view from my hotel room was an impressive one of human engineering. As I was admiring the feats of man, I realized that the only non-man-made thing I could see was the sky and I started to feel claustrophobic. I had to get outside and find a tree, at least. We have spoken about writing music, and I confided in you that I remain self-conscious about sharing my compositions. You said that you used to feel that way, as well. Has becoming a public figure provided that push you needed to share your music and art? Yes and no. Being well known makes a person more scrutinized by more types of people, so there is a greater chance that more people who hear it will not like it. Yet, being well known for something besides my passion for music makes me more eager to share my musical side. I just like the music I create a lot. I am proud of it. I don't mind if people don't like it. I am writing it for myself, and for the people who appreciate it. Tell us about your fantasy novel and related art? Have you considered turning this into a graphic novel? I have been slowly creating a series of high fantasy novels since I was a pre-teen. A friend of mine joined me in the venture a few years later. It is a fascinating story that spans twenty volumes and has unique forms of magic, five original languages (grammar, vocabulary and all) and truly explores the human condition. I can't wait to share it. I do not want it to be a graphic novel. It is too much of a tangled web. It needs to be a regular novel with maps and maybe some images in the appendix, or support volumes. I find that giving hints and clues of the picture you are trying to paint allows the reader to paint their own images, which are always far superior to anything I could draw. While I love to draw, what comes out of my pen is not always what is in my head. As to the books themselves, they cover a span of approximately two thousand years. The magic in it is less "Merlin" and more "Moses". It has a very clean…almost Eastern feel to most of it. While it is fantasy it's beauty relies on how believable it is. Dragons don't talk or breathe fire; in fact it takes a fighting squadron of five to eleven men to bring one down. There is real emotion in the book. Everyone and everything has flaws and limitations. You can't just do whatever you want with the magic. I know how the magic works and there are flaws and limitations built in. Everything is there; original fighting techniques, languages, religions, governments, evils, creatures, and one heck of a story…I just can't wait to share it. How did you come up with the novel's idea and visual world? When I was twelve I drew a character, a doodle really, of a boy named Yonus. From that point I started creating the place where he would live and friends he might have, the languages they might speak, what they might believe and it just snowballed from there. As I grew up, Yonus did as well, and the world he lived in became more and more rich and sophisticated. When my friend, Mike Richie, got involved he was a really good sounding board off of which I could bounce ideas. I invited him to join in and it really took off at that point. Right now we look at what we have created and it blows our minds. I have been drawing ever since I could hold a pencil. Most of what I draw is either cartoony doodles with my kids, or scenes and people from my books. I love studying the details of the world around me so that I can apply that to my art. I prefer to translate that detail into things that don't exist in the world around us. If I am going to draw, why draw something that can be seen every day? Everytime I see you, you're reading a book. What do you read and how do they influence your own writing? I read a lot of Orson Scott Card, Dan Brown, H.P. Lovecraft for fun and adventure, but my favorite things to read are ancient folklore and legends such as, the "Saga of the Volsungs," "Gods and Fighting Men," W.B. Yeats, etc. The latter type truly inspires the writing of my books. Those are real stories with real deep symbolism and meaning that relate to the core of what humans need to believe. That is the feel I want my books to have. Ironically, I only started reading Tolkien when I was twenty-five. I had read The Hobbit back in the seventh grade, but it didn't really influence me much. I won't compare my books to his as they are similar only in detail. But I did read an article where Tolkien explained what he wished he had done differently about his Lord of the Rings story, and I found I had already avoided those pitfalls. Tell me more about your band, Carpetshark, which is very much a family affair. I've heard an album is in the works. What is a "carpetshark" anyway? I have been playing off and on with two of my truest friends, Chris Caron (guitar, vocals, bass) and Chris Montecalvo (percussion, drums) since I was fourteen. That amount of time together allows for an ease of communication that most bands only dream of. We are able to have a three-hour long jam session and write three to five new songs. The amount of music we have is incredible.Then we add my lovely wife, Reanna (bass, vocals, strings), on top of that and things couldn't go smoother. Carpetshark comes from a game we all played when we were little where the floor is "water" with sharks in it and you can't touch it. Our first album is most likely going to be called The Floor is Lava after the same such game. Right now we have enough music for about four albums, but we are cranking down on perfecting twelve tracks for the first album. It is really difficult for us to classify our music, not because it is particularly weird, but because we play whatever we write. It can be anything from the mellow shoe-gaze style of "Fake Plastic Trees" by Radiohead to "Porch" by Pearl Jam, "The Pretender" by The Foo Fighters or "The Royal We" by Silversun Pickups. We are definitely alternative, and it seems that no matter what type of music you like, Carpetshark will have at least one song you will enjoy. That's what I've learned by showing it to people. I've heard that you actually compose music while on the road filming Ghost Hunters. Can you share your creative process, whether it is writing music, stories, or drawing? I do compose music while on the road. I write "email music" with Chris Montecalvo. I'll write something in Logic Pro or Garage Band then email the track to him and he adds a beat. Then we go back and forth until we have a solid song. I am not sure that I have a defined creative process. I just get an idea and then I shape it and hone it and run it over again and again in my mind until it is to the point where I think it is done. Then again, sometimes I just wake up with a melody in my mind, then I run to my guitar and write a song, or run to a recorder if I am on the road. It seems that artistic expression is very much a family affair in the Wilson household. Do you and wife expressively promote creativity? Our home is VERY creative. My boys have been drawing, writing, and composing music since they were almost too young to start. You can't go anywhere in my home without being a couple steps away from a musical instrument or a piece of paper and a pencil. My boys are always singing, humming or beat-boxing around the house. Reanna and I are both very creative based people and we want our kids to be that way too. We want them to be successful with it as well, so we teach a love for the arts as well as a sense of responsibility so that the arts can be a joyful means of survival. It's good to be successful financially, but, fifty years from now, how many people are going to remember the CEO of a successful company, and how many people are still going to be reading the books of a successful author or listening to the songs of a hit composer? If we really want to leave a mark on this world, the arts strike deeper, in my mind. There seems to be some connection between artistic expression and many who have interest in the paranormal. Why do you think this is so? Is there some type of "creative persona" that is more attuned to events outside of the norm? One has to have an open mind with the paranormal otherwise they can't process it and therefore reject it. So, it seems natural that the paranormal would attract a creative mind, as most infant sciences do. It's a good thing too, because we need as much innovation and creativity in this field as possible. Unfortunately, the creative side can take over and many people rush too quickly to a conclusion and therefore they are often wrong. Balance and moderation in all things. What is in store for Grant Wilson, the musician/writer/artist? Do you feel that your time on Ghost Hunters will eventually help launch an entirely different career in the future – perhaps one that focuses more on artistic expression rather than spectral pursuits? Ghost Hunters is allowing me to explore my paranormal interests to the fullest extent. That interest will always be there. It has opened me up to new mindsets, ideas and fields of interest. Music, writing and drawing where there first and have a deeper rooting in me, so they will never go away. I intend to fully explore those to their full potential as I have with the paranormal. I think what is so cool about you is that you're an accessible guy with no pretensions who is engaging something you love: music, art, writing. What words of inspiration do you have for aspiring writers/artists/musicians? Don't ever give up. Write, draw, play, paint, sing whatever YOU enjoy, and let the world say what they will. Make art for you, if you only make it for others you'll never make true art. It's ok to make it for others, but make sure you make some for you. Chances are, what you make for yourself will be more prized than anything you make for others. But, on that note, separate yourself from your public work a degree or two. It will allow you to take constructive, and non-constructive, criticism more easily. I have works of music, art, and writing that I don't share with anyone. It's my own private collection that can never be harmed by public scrutiny. Having that will offer a mental safety net that is quite valuable. Remember, each idea that is out there didn't exist before. Make new ideas, fill the world with beautiful, meaningful creativity that will be here for centuries to come. Visit here to see more of Grant's art work, and become a Carpetshark Facebook Fan!